If you’re trying to rank a social media page on Google, such as a YouTube video, or a Facebook page, there are some specific things you need to know. For example, Google has a very complex set of algorithms that they use to determine which YouTube videos should rank the highest on the YouTube search engine, which then translates to rankings on Google, if they think people want to see video results for that search. I will do my best to break down the specific things you need to know with each type of social media page, along with giving an explanation of how to do link building that will work to rank any page. You might notice, if you can be bothered checking, that this Facebook page affordable social media marketing services is outranking the home page of this site for the same keyword phrase. That’s not a big search, but anything to do with social media marketing or internet marketing has a lot of competition, so it’s not a bad example of how you can get a Facebook page on the first page of Google. What I did for that one was first of all get a bunch of random likes, and I also made other pages which I then used to make cross links to that page. I liked that page with my other pages, by using Facebook as each page, and clicking the like button, which puts a permanent link on the other pages. I constantly update each of those pages with new posts and videos, like social media tricks, social media marketing services, page likes, welcome page, social media marketing tips, social promotion services, and it’s all linked together in such a way that it has really good SEO. I made backlinks to the page, from articles on different sites, (I’ll be mentioning the sites I use for backlinks later), and I also have a backlink from the home page of this site. If I removed the link from the home page of this site, the Facebook page would probably fall down the page a bit in rankings, but I decided to keep it there, just to show that it could be done, and that you could rank a Facebook page higher than a PR 3 WordPress website that is constantly updated with new blog posts, and has hundreds, or even thousands of backlinks leading to it. If you’re interested in getting my help in ranking your Facebook page on Google, send me a message to talk about that, or about anything you want to talk about, I can probably help. Ranking a YouTube video on Google is not an easy task, and at the same time, it is a lot easier than ranking an ordinary web page. Sound confusing? It depends on so many factors, that it’s not easy to say that there is a process that will work each time, it’s more a matter of doing certain things to the best of your ability, and hope it works. You see Google likes to show video results on a lot of searches, but they don’t show video results for all searches, just the ones they think have the subject matter which means that’s what they think people want to see. I’m not sure how they work out which searches are the ones that they think people want to see videos for, but I have got some idea of which videos come up at the top of a YouTube search, and therefore a Google search. The bounce rate is very important, because Google can’t really tell what’s on a video, but they can tell if people are watching it all the way through. They can tell if people are leaving comments, clicking the like button, subscribing to the channel, clicking the share buttons, and if the video is being embedded, and if it has backlinks leading to it. You can manipulate some of these figures, but the main thing that you’re going to have to get right is making a video that people actually want to watch. If you get everything else right, and the video is completely boring, like a dull ad with nothing interesting happening in it, it will probably slip down in the rankings, regardless of how many high quality backlinks you make to it. I am an amateur video maker, but I can help you out with a nice looking video for a really good price if you want to try out my services. Again, send me a message, my email is in the sidebar if you want to talk about that. I can also help you out with the social sharing side of things, and if I publish a video to my channel, it stands a much better chance, since my channel is fairly highly regarded and has had many thousands of views and lots of videos published on it. That’s the other thing, it’s not just the video itself, it’s the channel as a whole, and you can increase the ranking of your videos by being active on the site, like leaving comments on other videos, publishing regularly, giving the signals that you are an important member of the site. I’m not sure how much Google cares about backlinks leading to YouTube videos, or Google Plus pages, but I assume it’s a bit like any other web page, and I know a bit about how to build effective backlinks to rank any page. If I wanted to rank a page like this, I would start off by writing a few high quality, original, relevant articles of over 500 words on sites like Ezine, HubPages, Go Articles, Yahoo Voices, Knoji, Squidoo, Info Barrel, eHow, Triond, Typepad, Blogger, and build them in a link pyramid, so one backed up the other one. If you don’t know what I mean by that, I might write one on Knoji, and then write a HubPages article that linked to that one, and a Blogger post that linked to the Knoji article as well, with the aim of making a higher PR link that linked to the first site. According to It Rate.co, the important thing is that it looks natural and looks like a quality link. It might also help to link out to authority pages such as Wikipedia because that will really make a difference. You can make social bookmarking backlinks, or do blog comments, but what you really have to avoid is looking like you’re just making spam links just for the hell of it. Recently Google made changes that meant that a ton of different techniques which used to work, no longer work. For example, they de-indexed a ton of blogs on blog networks like Build My Rank and Buy Blog Reviews. If you purchase almost anything that might have worked well a couple of years ago, odds are Google will punish you for it. What I mean by that is that if you buy a .edu link, or 1,000 backlinks made with software like Xrumer, or whatever, nine times out of ten it won’t work, and might even be a negative. The way to build high quality backlinks is by writing high quality, original material, or if you can, finding someone who has that sort of stuff, and asking them for a link. For example, I accept guest posts on this site, if they are really high quality, relevant to what this site is about, (internet marketing, social media marketing), over 400 words, etc. I also write articles myself, although my services don’t come cheap, because it’s not easy to write high quality articles for a product, and also do it in a way that really works for SEO. I don’t claim to be an SEO expert, although I do probably know more about SEO than half of the people who are out there claiming to be experts. It’s just such a complicated thing, but I know enough to say I could help, if you want to talk to me about that. 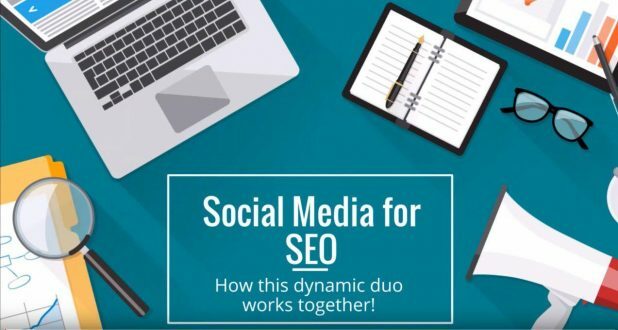 So there you have it, some tips on social media SEO, that I hope you found informative. If you would like to ask me any questions, or talk to me about how to improve your rankings, or promote your site, send me a message, and I’ll do my best to sort you out.